Vector drawing is almost an art in itself, and something that takes time to master. VectorDesigner is a good program both for those looking to learn all about and others who already have some experience with the technique. 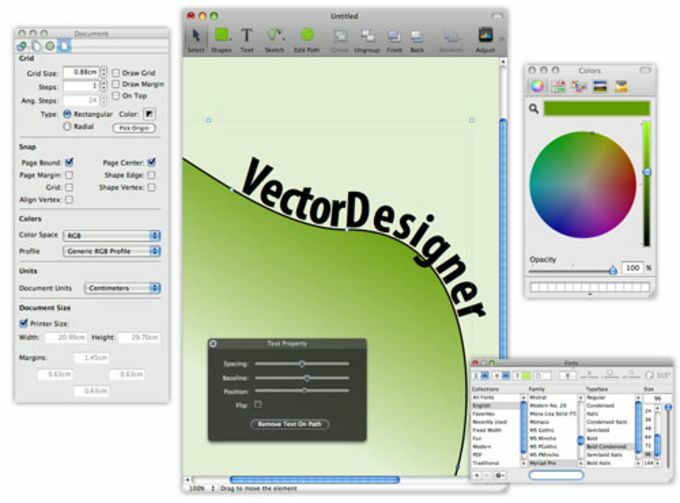 VectorDesigner offers a simple, multi-windowed interface from which you can use all sorts of tools and shapes like rectangles, stars, polygons or bezier creations. Boolean tools offered by the program are easy to work with and let you combine your different shapes in all sorts of ways. Vector drawing is perfect for creating posters, stickers, t-shirts...anything onto which you can apply a design. VectorDesigner takes this into account and lets you constrain text to any shape. The program includes many filters and compositions, however some effects will only work if you're running Mac OS X 10.5. One element we did enjoy was the Flickr browser tool, by which you can find images in the photo sharing site. VectorDesigner gives anybody the chance to work with vector drawings and create great looking designs thanks to powerful tools and effects. VectorDesigner is a new vector drawing application designed to be simple, intuitive and powerful to use. It has everything you need to create fancy vector graphics such as posters, brochures, stickers, logos, web design, t-shirt and more. It features a wide range of tools: smart shapes such as rectangles, ovals, rounded rectangles, polygons, stars, bezier creation and editing and even conversion from raster to bezier. Boolean tools let you can combine shapes using unite, subtract, intersect and xor. Text can be constrained within a shape or along a path preserving all the text editing capability of Mac OS X. The integrated flickr browser lets you search texture and images by tag or by color and download it directly inside the document. All the filters and composition available on Mac OS X can be applied in a non destructive way to shapes and images. Printers are using a different technology to create colors (CMYK) so they are not able to reproduce all the colors that you can see on screen. VectorDesigner solves the problem automatically softproofing the document and displaying on screen a very close representation of what you will get on paper. good program, bad service. I agree with the thoughts that Tweakersoft have little understanding of customer service. Pros: Vector program. What a FIND. I was looking for, and tried, about a dozen programs to use for drawing a bathroom vanity design. The majority of what came up in my searches were programs that had way too many bells and whistles and were very difficult to use. At least I THINK there were more bells and whistles. The problem is they were so difficult to use, I have no IDEA what they had. I LOVE this program. VectorDesigner is really intuitive. It's easy to get started with immediately, without having to search help and view tutorials. I am only now realizing that had I done a little looking first, what I was able to render would have been even easier with available tools! What do you think about VectorDesigner? Do you recommend it? Why?